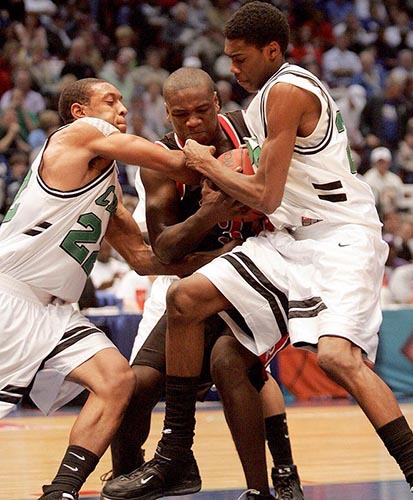 Jarodiaus Willingham of Decatur High School, center, fights for the basketball with John Carroll High's DeMarcus Covington, left, and Ryan Fitch during a Boys Class 5A AHSAA Basketball State semi-final game in Birmingham in March 2007. Courtesy of The Huntsville Time. All rights reserved. Used with permission. Photograph by Robin Conn.